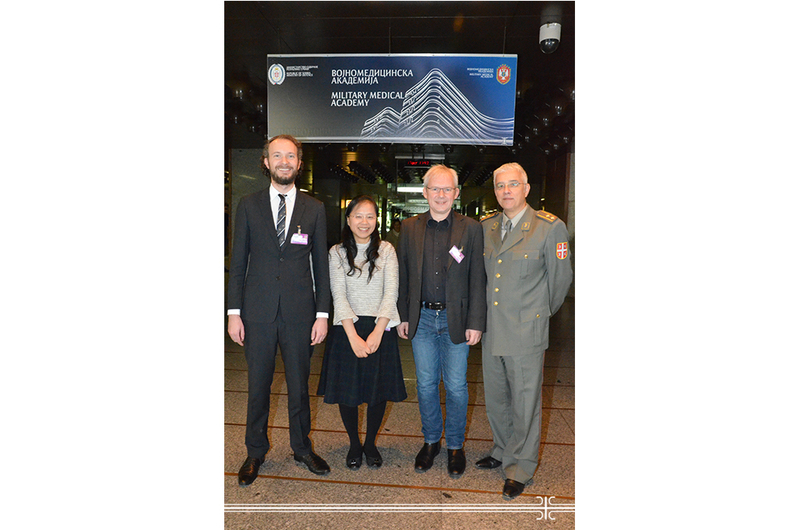 Symposium on Clinical Neurophysiology with international participation, organized by the Clinic for Neurology of the Military Medical Academy and the Association of neurophysiologists of Serbia was held at the Military Medical Academy. Head of Sector for Education and Scientific Research Col. Dr. Miroslav Brocic welcomed the lecturers from abroad Professor Dr. Michael Nitsche from the Leibniz Institute of Neuroscience in Dortmund and his associates, Dr. Min-Fang Kuo and Dr. Jan Grosch and said that this symposium is one of the major challenges and it significantly boosts the further development of the profession. He also said that the central nervous system is anatomically very complex and requires the study of many aspects that are nowadays more and more unified, and that the biomedicine today is one of the key drivers for the development of scientific thought. In the introductory part the academician Dejan Popovic, a corresponding member of the Serbian Academy of Arts and Sciences, addressed the audience, noting that today's meeting is a good opportunity to learn new things thanks to foreign participants, but also to determine the place of our experts in this area. Lt. Col. Prof. Dr. Tihomir Ilic from the Clinic for Neurology MMA said that the topic of the symposium - a non-invasive neuromodulation takes an absolute priority in the field of clinical neurophysiology. He pointed out that although this technique has been present for more than 20 years in Serbia is not sufficiently represented yet, but the interest of scientific and professional community is notable regarding further development of biomedical engineering. The professional part of the symposium, intended for both neurologists and all other branches of rehabilitation medicine and cognitive neuroscience, was divided into three parts. The introductory session was devoted to the basics and mechanisms of neuromodulation, while the other two related to the clinical use of noninvasive brain stimulation. Speakers at the symposium except for member staff of the Military Medical Academy were doctors of the Clinical Center of Serbia, Clinic for rehabilitation "Dr Miroslav Zotovic" and the Institute of Mental Health of Serbia.